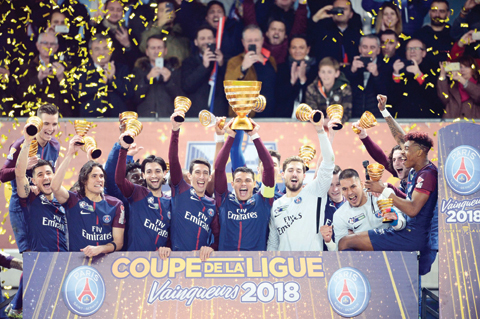 BORDEAUX: Kylian Mbappe played chief tormentor as Paris St Germain beat Monaco 3-0 to claim their fifth French League Cup title in succession on Saturday in a game where video refereeing played its part on Saturday. PSG, who have now won their last 40 games in the French Cup or League Cup, prevailed through an Edinson Cavani double and a goal by Angel Di Maria, but it was France international Mbappe who caught the eye at the Matmut Atlantique. The 19-year-old, who is set to be one of France’s key players at the World Cup, won PSG’s early penalty and set up both the other goals in a man-of-the-match performance. It is PSG’s second final victory against Monaco after they beat them 4-1 last year, but it will do little to erase the bad memories from another early exit in the Champions League after they were eliminated in the last 16 this season. Portugal might sweat over midfielder Joao Moutinho’s fitness ahead of the World Cup after he was carried off the pitch on a stretcher with a suspected knee injury. Clement Turpin, who will be one of the referees at the World Cup in Russia, used the video assistant referee (VAR) technology to award PSG an early penalty after Kamil Glik had brought down Mbappe. Cavani converted it to put PSG ahead on eight minutes, underlining Ligue 1 leaders PSG’s superiority over the likely runners-up. The Parisians were clearly a cut above and on a lightning-quick counter-attack, Mbappe’s delightful pass found Di Maria, who coolly slotted the ball past Danijel Subasic in the 21st minute. Monaco had promising ideas but Thomas Lemar, Youri Tielemans or Rony Lopes were too clumsy in the box. After being sent through behind the back of the PSG defence, Lopes’s chip shaved Kevin Trapp’s left-hand post 10 minutes before the break. Monaco thought they had pulled one back in the 37th minute through Radamel Falcao, but Turpin disallowed the goal after VAR showed that the Colombia striker was offside when he headed past Trapp. Leonardo Jardim beefed up Monaco’s frontline for the second half, replacing Tielemans with Stevan Jovetic. But PSG were still the more dangerous side as Julian Draxler repeatedly unsettled the Monaco defence, although the visitors had a great chance when Lopes’s powerful shot bounced off the crossbar. Mbappe was a constant threat to the Monaco back four, setting up Cavani for another offside “goal”. Monaco continued to push but Cavani beat Subasic from close range after collecting Mbappe’s through ball five minutes from time to ensure PSG remained unbeaten in national cups since early 2014.